Clive Powell was 16 years old when he signed to rock and roll impresario Larry Parnes. Parnes gave all his artists new names- Marty Wilde, Billy Fury etc. After a false start- the original suggestion of 'Lance Fortune' was adopted by another singer before Clive could sieze it- Larry suggested 'Georgie Fame' and despite Powell's doubts the name stuck. 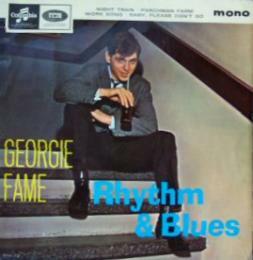 At this time Georgie Fame was already pianist with the 'Blue Flames', the group that backed Billy Fury. His style was chiefly based on that of Jerry Lee Lewis- hardly the bluesy stuff he would become famous for later. Billy Fury split with this high quality rock and roll band because his own style became increasingly dependent on ballads. However, the Blue Flames went from strength to strength with Georgie becoming the regular on vocals as well as keyboards.The band's musical style also broadened becoming a jazzier blend of rock and roll with modern blues. The title of the EP shown here on the left (SEG 8382) leaves us in no doubt as to Georgie's main musical allegiance. It is actually a live recording made at the Flamingo Club in London. The band became so popular that Georgie actually charted with an LP a couple of month's before he did with a single. However, that single was such a smash hit that it finally fulfilled the prophecy set by his surname. Georgie Fame had a dozen UK hits including three #1s, one of which was the 'Ballad of Bonnie & Clyde' a record that also sold well in the USA. However by this time Georgie had started to steer his music away from its R&B roots towards jazzier middle-of-the-road material that would sustain his popularity on the cabaret circuit for many years. However, if you are lucky then you might hear Georgie singing the R&B material he started out with and still loves best. Keep an eye open for when he goes on tour as one of the 'Rhythm Kings' in the company of his friend, bassist Bill Wyman. Columbia SEG8334 1964 "Rhythm And Bluebeat"
Columbia SEG8393 1964 "Fame At Last"
Columbia SEG8454 1965 "Move It On Over"